In the course of doing my MA at the University of Chicago, I’ve had the opportunity to take a class from John Mearsheimer. Mearsheimer is one of the most widely renowned structural realists in the international relations game today. He disagrees with much of US foreign policy since the end of the Cold War, lamenting the US’s decision to expend its energies maintaining large military presences in regions of the world that contain no threats to the United States. Mearsheimer calls for a strategy of offshore balancing, in which the United States only intervenes in critical regions in order to prevent those regions from being dominated completely by another state. Otherwise, he recommends the US save its strength. 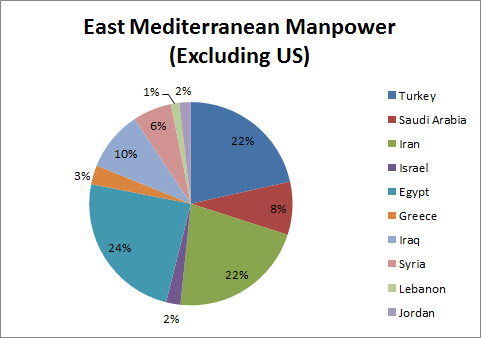 I found myself curious today about what many of the world’s region’s power relationships might look like if the United States were to withdraw militarily and allow the powers in those regions to engage in security competition with one another, and I have taken some time to run the figures and make a vast plethora of charts to share with you. He believes that the United States should almost never intervene outside of these regions and that it should intervene in the last three only when there is a potential rival hegemon in those regions. 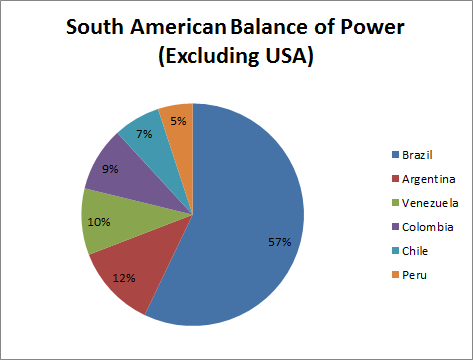 The western hemisphere is America’s home region, and consequently the United States has to ensure it remains dominant in this area, but, on Mearsheimer’s view, it can leave the other regions to handle themselves. 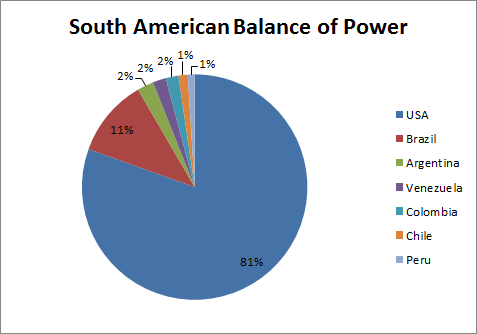 What I have done is taken the GNP figures of the major states in each of these regions (and a couple others–I was having fun) and created pie charts showing the relative shares of wealth those states enjoy on the theory that GNP is a fairly good indicator of latent power. 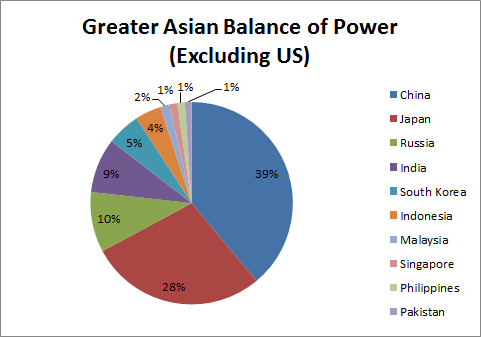 Latent power consists of a state’s economic leverage and potential resources available for military spending. 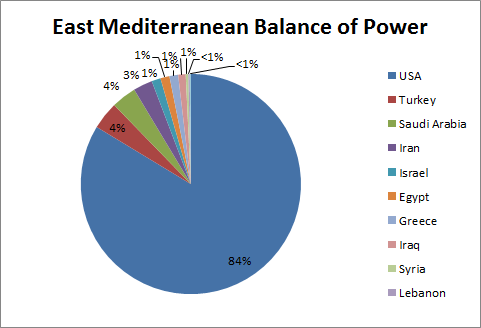 It is by no means a perfect indicator, but it is the one that Mearsheimer himself uses in his benchmark Tragedy of Great Power Politics when he compares the capacities of various states. 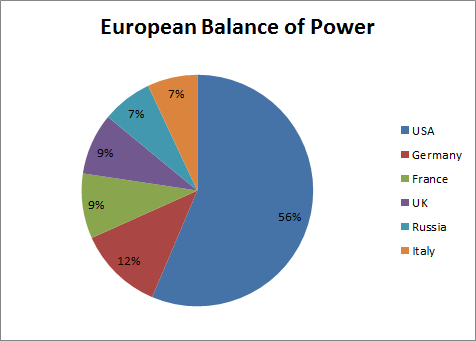 To provide some context for what share of wealth that might be sufficient to attempt to establish hegemony in a region, Mearsheimer claims that Wilhelmine Germany had 40% of European wealth (excluding the US) in 1913 and Nazi Germany had 36% (excluding the US) in 1940. This would give China about as much relative wealth as Germany before World War I, a war that Germany narrowly lost. 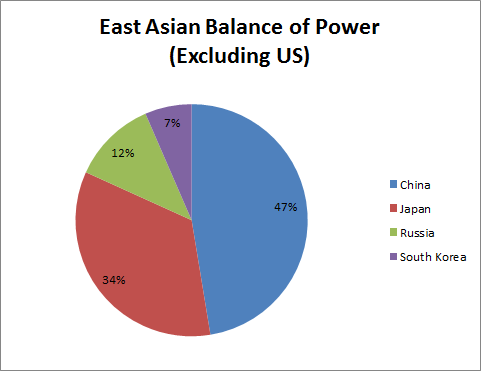 India has nuclear weapons, so a total Chinese victory would be impossible, but nonetheless, it’s reasonably likely that the United States would worry that the Japanese-led balancing coalition would fail and feel compelled to intervene to contain China, so the case for maintaining a presence in East Asia remains reasonably robust. This suggests that Iran would likely fair better in a conflict with Saudi Arabia than the raw wealth figures suggest purely due to its ability to field a larger army. Indeed, depending on how influential we think raw numbers are, we might say that Iran is the more likely would-be hegemon than Saudi Arabia. 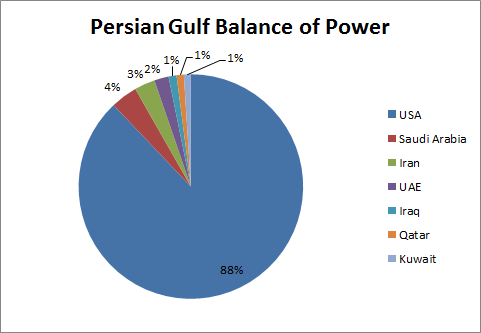 But in any case, US wealth completely outclasses Iranian wealth such that any serious effort by Iran to gain hegemony in the gulf could be easily countered without the United States going to much effort. My thinking here was indeed tested during the Iran-Iraq War, in which the US gave military aid to Iraq to prevent Iran from seizing its oil fields. 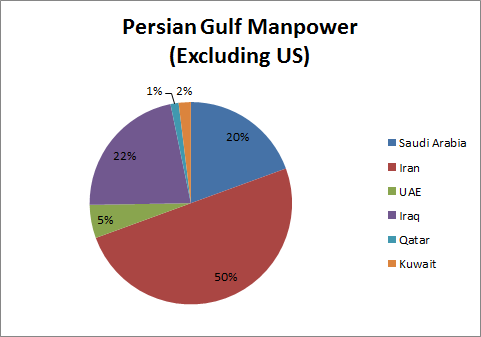 The US was able to counter Iran’s advantage in manpower and wealth without even deploying forces of its own to the region. 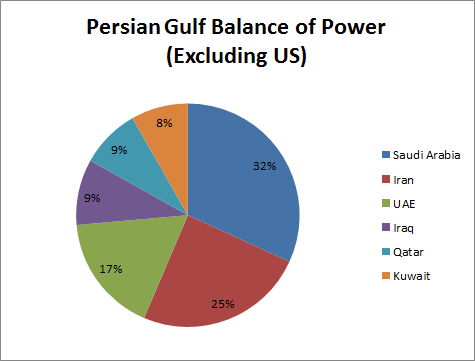 I see little reason to think that US military bases in the gulf are necessary, and Mearsheimer is right when he suggests that the US could resume the strategy it used during the 80’s and station what military forces it reserves for this region offshore. What about nuclear weapons? At present, none of these countries have them, though Iran may be pursuing them. If Iran were to get nuclear weapons, Saudi Arabia would likely pursue them and the two states would both face the logic of mutually assured destruction. 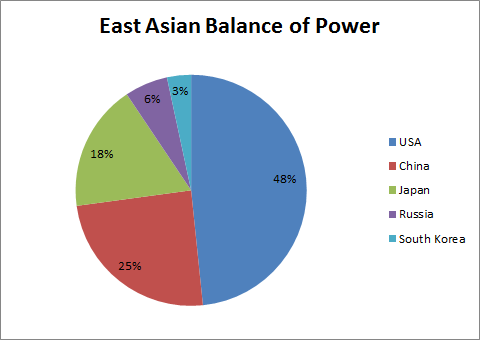 So these charts suggest that Mearsheimer’s view was quite reasonable in the early 90’s and, with the exception of East Asia, remains quite reasonable now. 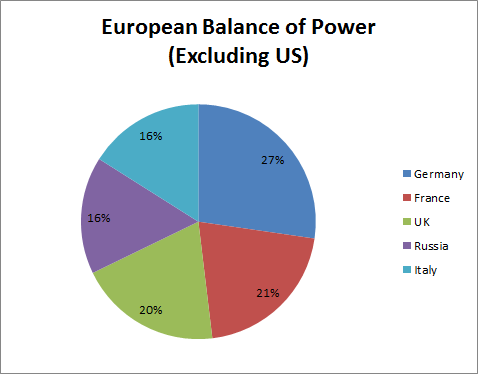 Were the United States to withdraw from Europe and the Persian Gulf, existing balances of power in those regions are sufficiently well-balanced to prevent the rise of a potential hegemon and, for the most part, keep the peace. Brazil goes on the march, and before long the entire continent is speaking Portuguese and hailing Dilma Rousseff as the new Latin American Caesar. Since none of these countries has nuclear weapons, Brazil could conquer the continent like it’s 1939. No, I’m afraid the United States needs to remain engaged in the affairs of its own hemisphere. At only 2%, Israel’s conventional dominance depends on maintaining a substantial advantage in military technology and organization. 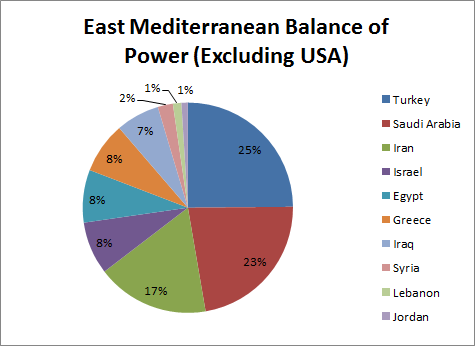 For these reasons, it seeks to tether the United States to it and keep it mired in the Eastern Mediterranean despite that region’s lack of immediate relevance to US interests.